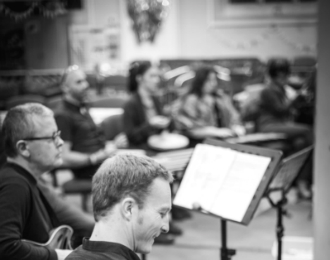 Brighton's New Note is the first orchestra in the world to be formed of recovering drug and alcohol addicts, helping members stay sober by focusing on creating and playing music. The group's latest work A Sense Of Place can be seen live in Eastbourne on November the 24th and Brighton on December the 2nd 2018. The New Note Orchestra is made up of 13 to 20 people at any given time, all recovering addicts, many of whom never previously picked up an instrument. Together the musicians create not just music but also a supportive community around each other, improving players' confidence and opening up pathways to mainstream education, employment and training. New Note compositions explore personal stories of descent into and out of addiction by combining documentary with live orchestral music. "Even to get a nomination for the prize is a recognition of the quality of the music we are making. It is an external validation. "To be shortlisted has already exceeded the members' expectations and is a real boost to their confidence. "When I first saw the orchestra perform I was struck by the joy of the group and also the quality of the music they were making. I knew the players were in recovery - it really was very inspiring. "Now that I am the Music Director, I find being a part of New Note is a very enriching experience. "They are so hungry to learn and are really up for the discipline of practising in an orchestra. "We place a lot of attention, not just on making music, but on listening to one another." Players come from all walks of life and include; teachers, journalists and construction workers. "New Note is such a special safe place for me. I get so much support from going. I love learning there and can"t tell you the pride I feel at being able to describe myself as a musician. "New Note helps us all in so many ways - we are little living miracles." The orchestra's latest production - A Sense Of Place - is a filmed documentary with a live performance orchestral soundtrack exploring the relationship of belonging and places in the lives of those in recovery from addiction. New Note Orchestra was inspired by the TV documentary Addicts' Symphony which was broadcast on Channel 4 in 2014. New Note Orchestra has been nominated for the best national Community or Educational Project in the British Composers Award, recognising the quality of its compositions. Saturday 24th November 2018 2 pm - Towner Gallery, Devonshire Park, College Road, Eastbourne. Tickets: £6 on the door.